CIMCO PDM is now known as CIMCO MDM or Manufacturing Data Management to reflect the significant improvements and capability enhancements to the platform. 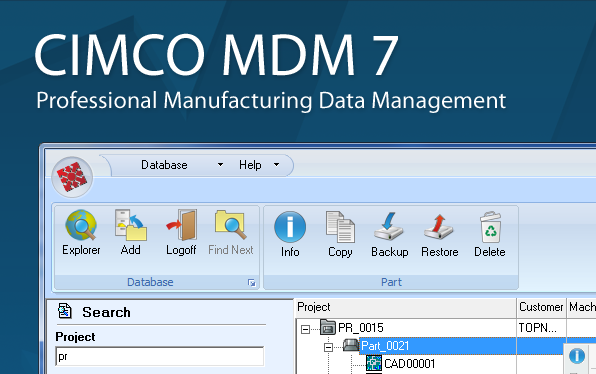 CIMCO MDM is a paperless manufacturing system that helps you securely store and manage your production related materials including CAD/CAM files, CNC Programs, tool lists, quality control documents, images, setup sheets and any other relevant files. Using a true client server application you have access and control of everything, right at your fingertips, anywhere in your facilities. The CIMCO Product suite is a diverse set of software tools that allow you to manage, communicate, monitor, program and verify your nc data. CIMCO MDM can be used in conjunction with other CIMCO products such as DNC Max, MDC Max, and CIMCO Editor. There are previews for many CAD/CAM file types, images, PDF files as well as customized applications for any file type. CIMCO MDM goes well beyond the typical PDM software that is currently in the market place. See for yourself, call or contact us to arrange a demo, or make a detailed inquiry online.